For many years the thinking was "Stiffer is Better." While that may be true for a lot of people, those who want controlled flex in their bindings were SOL. With the sidewinder's lateral play and vibration absorption, those that want more flex now have it! 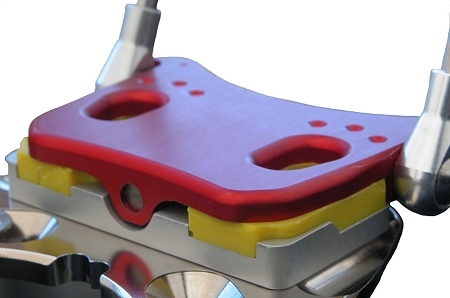 Other then the special sole block assemblies the TD3 Sidewinder has all same function and adjustments found on the TD3 binding and is now available in both Standard (shown here) and Step In versions. The binding comes with either Medium (Blue) or Soft (Yellow) E-pads. It also comes with Bomber's traditional 3 year warranty. - Bomb-proof, made in America durability. How does the TD3 Sidewinder work? The Sidewinder uses a two piece sole block assembly with a precision pivot and bearing that allows it to “roll” side to side. The motion is controlled with the use of Urethane pads we call “E-Pads” that are inserted in between the upper and lower Sole Blocks. You can control the amount of movement in the Sidewinder by using different density e-pads. Not only does the system give you side to side motion, but the e-pads also dampens that motion. NOTE: The SW SI has fixed e-pads on the heel piece. 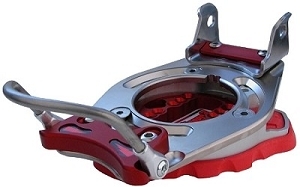 SW weight with 3-3 plus e-rings and screws is 4.5 pounds (2.2 kg). TD3 bindings function properly ONLY with DIN standard snowboard hard boots. For boot sole length 260 and under, (for Raichle/Deeluxe and Head boots, this is a 22) you will need to follow these instructions. The largest is a sole length of 332 (approx. mondo 31). 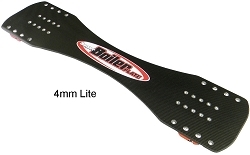 If you have larger boots, we have a long base plate as an option. All you need to do is make note of such in the comments section when checking out. 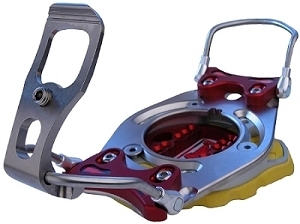 If you are using this on a Boiler Plate (or any plate system) and would like the lower version of the cant disk, center disk, and e-ring choose the BP version. If you are not using a plate system, choose the Traditional Version. The BP version was not designed to be used without a plate system. Mounting it directly onto a board is done at your own risk and not recommended by Bomber. Extra Thick E-Ring: 7mm total thickness versus 2.5mm of TD2. An amazing amount of absorption and movement of the binding may now be achieved. Hard Stops on Bails: No more floppy bails or springs to worry about. All bails have hard stops to keep the bails in their “cocked” position. This includes the Toe Bail for the standard binding - keeping it in a “ready” position to make manual entry a breeze. Hardened Steel Step-In Receiver: No more galled up aluminum step-in receivers that seem to attract snow and ice. The new steel receiver makes for super smooth step-in action and incredible wear resistance. We also added an “Ice Buster” lock-bracket to hold the receiver down that incorporates a sharp ridge to facilitate snow and ice removal from the bottom of the heel. Through Shaft Design on Bails: No more shoulder bolts, the TD3 uses a one piece through shaft to connect the lugs/bail assembly to the binding. Simple, strong, and on line with the Trench Digger's reputation for set-and-forget reliability. We also still maintained the Micro-Adjustable of the lugs if needed for fine tuning the boot fit. New Base Plate Design: the new Base Plate for the TD3 has the center section removed allowing you to access the Center Disk for ease of removal and installation of the entire binding. Need to remove the binding for waxing or travel? No problem, back off the 4 screws and good to go. No more need to disassemble the entire binding. Super Low Profile Toe Clip: The new TD3 toe clip has the lowest profile on the front of the boot of any toe clip out there. We designed the new toe clip around all current day modern snowboard hardboots to minimize overhang that has become an issue with today’s lower angles used in carving. We also increased the lever arm to reduce the effort of clipping in. Traditional or BP - What's the difference? For help in selecting cant disks, go here. Need help with E-Pads? 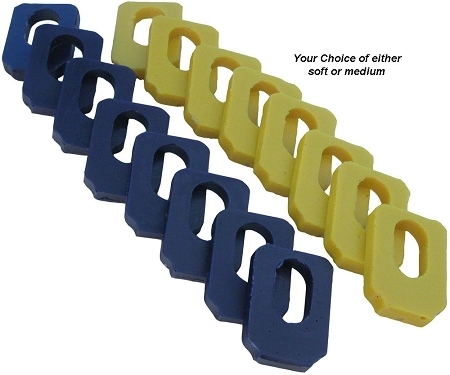 Our recommendation is thus: if you are over 150 pounds, use medium (blue). If you are under 150, use soft (yellow). Hard Stops on Bails: No more floppy bails or springs to worry about. All bails have hard stops to keep the bails in their â€œcockedâ€ position. This includes the Toe Bail for the standard binding - keeping it in a â€œreadyâ€ position to make manual entry a breeze. Hardened Steel Step-In Receiver: No more galled up aluminum step-in receivers that seem to attract snow and ice. The new steel receiver makes for super smooth step-in action and incredible wear resistance. We also added an â€œIce Busterâ€ lock-bracket to hold the receiver down that incorporates a sharp ridge to facilitate snow and ice removal from the bottom of the heel. Super Low Profile Toe Clip: The new TD3 toe clip has the lowest profile on the front of the boot of any toe clip out there. We designed the new toe clip around all current day modern snowboard hardboots to minimize overhang that has become an issue with todayâ€™s lower angles used in carving. We also increased the lever arm to reduce the effort of clipping in. Nickel Coated Parts: We have selected a few key parts to receive a Nickel coating for its amazing protective properties, but more importantly it is very effective at resisting and repelling ice and snow. Compatibility with TD2: The TD3 uses the same Cant/Lift disks as the TD2. So no need to start over with your selection of cant/lift disks, they will work on the TD3. E-rings, however, are not compatible. Fully Suspended Binding: the TD2 introduced the concept of suspending the entire binding with a two piece lower assembly that uses a pad called the E-Ring for vibration absorption and allows for movement in the binding. The old TD2 system was based from a 2.5mm thick E-Ring. The new TD3 system is a supercharged version of this concept. We have increased the height of the E-Ring to 7mm and are now using a proprietary material designed just for our application. 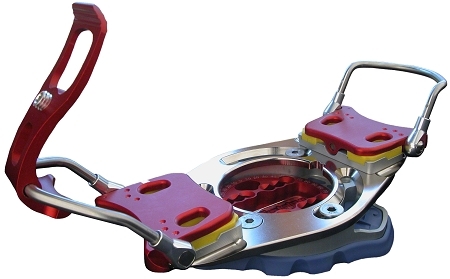 As before the new TD3 E-rings are available in soft (yellow), medium (blue), and hard (red) so you may tune the suspension of the binding. Adjustable Cant and Lift: The TD3 is available at the time of purchase with any combination of 0, 3, or 6 degree cant/lift disks. These disks are then rotatable under the binding (in 5 degree increments) to allow you to adjust the angle of cant/lift. Aluminum and Stainless Steel Construction: As always Bomber does not make wimpy gear! The TD3 uses strong and dependable materials where it is most important. A reliable binding that you do not have to think about while making a high-G turn is our goal. Laser Engraved Settings: Lets be honest, we love numbers and the ability to quantify our set-ups. The TD3 has easy to read laser engraved angle indicators that are also used to determine your cant/lift angles. This allows you to keep track of your set-ups and be repeatable in your adjustments. Other Features of the TD3: 5mm hex sockets (key included), 3 and 4 hole compatible disks available, 360 degrees of stance angles, our famous 5 Year Warrantee, and of course great customer service. 5 Year Warrantee & Full Parts Support: We trust our products so much, we back up the TD3 with the best warrantee in its class: 5 years from date of purchase. 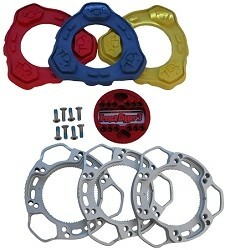 We also have full parts support in the Bomber Store if you need something fast. All TD3 bindings come complete with: bindings, mounting hardware, leash, 5mm Hex Key, and detailed instructions.